You can enjoy a meal at the restaurant serving the guests of Hotel Apartamento do Golfe, or stop in at the snack bar/deli. Wrap up your day with a drink at the bar/lounge. Buffet breakfasts are available daily from 8 AM to 10:30 AM for a fee. Satisfy your appetite at Mourabel, a poolside restaurant which features a bar and a garden view. Dining is also available at the coffee shop/café. Mingle with other guests at the complimentary reception, held daily. Wind down with a drink at one of the 2 bars/lounges or 2 poolside bars. Continental breakfasts are available daily from 8 AM to 10 AM for a fee. Enjoy a range of recreational amenities, including an outdoor pool, an outdoor tennis court, and a fitness center. Additional features at this apartment include complimentary wireless Internet access and tour/ticket assistance. Guests can catch a ride to nearby destinations on the area shuttle (surcharge). Relax at the full-service spa, where you can enjoy massages, body treatments, and facials. You're sure to appreciate the recreational amenities, including a health club, an outdoor pool, and an indoor pool. This hotel also features complimentary wireless Internet access, concierge services, and babysitting/childcare (surcharge). Enjoy recreation amenities such as an outdoor pool or take in the view from a garden. Additional amenities at this apartment include complimentary wireless Internet access and tour/ticket assistance. Enjoy recreation amenities such as an outdoor pool or take in the view from a garden. Additional features at this aparthotel include complimentary wireless Internet access and tour/ticket assistance. The apartment hotel is situated in the heart of Vilamoura, next to the golf course and 2 km from the centre, where guests can find shopping areas, the marina, beach, bars and restaurants. Tennis courts can be found around 2 km away, and horse riding facilities are located roughly 2 km away. The nearest bus station is around 50 m away, and the train station is some 12 km away in Loule. 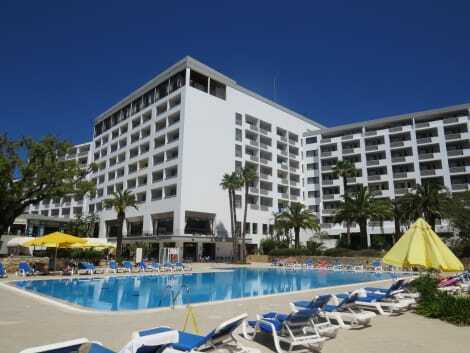 The hotel is around 22 km from Faro Airport. This is a resort with 18 family villas, which are fully equipped and provide all the comfort, relaxation and tranquillity that guests could want. All the Villas have 2 floors. The villas have a private bathroom with a shower, bath and a hairdryer. The rooms include double beds, satellite/cable TV, a safe, washing machine, individually regulated air conditioning, a terrace and a kitchen with fridge and microwave. There is a swimming pool at guests' disposal, and sun loungers and parasols are available for hire (for a fee) on the nearby sandy beach. A luxury seaside town with a large marina full of expensive yachts and lined with bars and restaurants, Vilamoura is situated in Portugal's breathtaking Algarve region. A coastal paradise, Vilamoura has it all: sun, sea, sand, high-end golf courses, historical attractions and more. 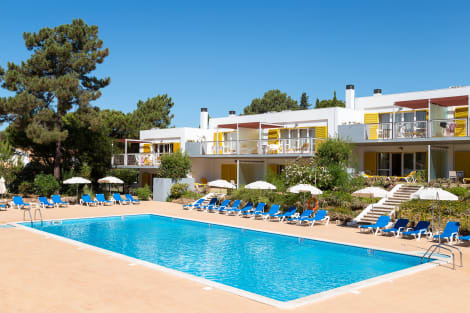 The perfect spot for a short stay or longer break, there are a number of Vilamoura hotels from which to make your base for exploring the area. The first settlers in the area were the Romans, who brought with them their signature architectural touches, accented with pillars and arches. The ruins of Cerro da Vila is all that is left of Rome's occupation, and it can still be visited today. The real heart of the town of Vilamoura is undoubtedly the vast marina, the largest in Portugal with well over 1,000 berths. The marina is surrounded by large hotels, luxury holiday homes, restaurants, bars and charter boats available for deep-sea fishing. The adventurous can hire a jetski or try their hand at parasailing, scuba diving or kitesurfing, while golfers have a choice of four immaculate Vilamoura golf courses, making the area very appealing indeed for golfing holidays. Visit traditional markets in Loulé and Quarteira and enjoy day trips to Lisbon, Fatima, Gibraltar and Seville for shopping and sightseeing. Take a tour around the preserved Roman site and the museum of Cerro da Vila, the remnants of a Roman villa and bathhouse in the area close to the marina. Hire a car and explore more of the Algarve. With castles, churches, monuments and areas of stunning natural beauty, the opportunities for sightseeing in the Algarve are endless! Families and the young at heart will love a trip to Aqualand Algarve, a waterpark full of thrilling waterslides, from the hair raising Kamikaze to the lazy Congo River. With plenty of refreshment stations and shops, you'll find everything you need for a fun-packed day. Head to Zoomarine, a marine park plus waterpark. Here you can learn about many different species of marine and animal life, watch a fantastic dolphin or sea lion show, or be lucky enough to swim with a dolphin. There is a big wheel, pirate ship, flume ride and mini roller coaster as well as plenty of refreshment areas. There is an extensive selection of cuisines available to try in Vilamoura, including authentic Portuguese dishes and sumptuous international meals. Try Oliveira Dourada for some traditional Portuguese dishes such as fish curry, wild boar and Portuguese steak in an extremely friendly atmosphere. A Carpa also has excellent fish and seafood and other traditional dishes.